Teaching children the value of a dollar is one of the most important lessons that parents can offer, yet it’s sometimes looked over. Life is busy and you may feel like you can’t teach them such a big concept, but the truth is you can help them learn about money and spending by just going about your day and including them in it. By involving them, you are setting them up to be responsible adults. If you can, start talking about money and value early. 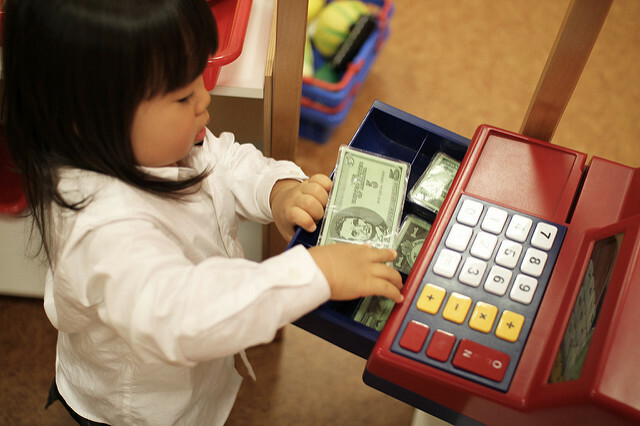 Preschoolers can understand the concept of money in a way, and can remember it’s value. The next time you go to the store, let them pick something out and tell them it must be under a certain dollar amount. They can read the numbers and learn how that translates into money. Young kids don’t understand the value of each coin and bill unless you teach them. Line up each coin in order of value and show them that even though a nickel is bigger, a dime is worth more. Show them that one ten-dollar bill is the same as ten one dollar bills. Small things like this will help them learn the value of each bill and how to count money. Once your child is older and can add and subtract proficiently, give them an item in the budget to manage for the month. This could be your grocery spending or even just the entertainment money, but it should be something that isn’t a fixed bill. Give them the receipts and ask them to keep up with how much is spent and how much is left. The best experience to teach children the value of a dollar is hands-on real world experience. Look no further than the grocery store. Take your child with you and give them their own list. Maybe they are going to buy ingredients for one recipe. Give them a certain amount of money and ask them to buy the items on the list without going over. Then let them go to the cash register and purchase it. This activity will teach them to be sensitive about price over brands, and how sales tax comes into play. If your child earns money through chores or good grades, help them make a budget. Show them how to set it up and encourage them to keep track of their money on a regular basis. You could set up a savings account in their name or just start them off with a piggy bank. Let them know that you don’t want to spend all your money, all the time, but instead should save a portion of it each time you get paid. Once they are older, encourage them to save money for a car. Look up the average cost of a used car and help them determine how much they need to save and how long it would take to pay for it themselves. In 2016, for example, the average cost of a used car is $18,000 and the average teen who works about 19 hours a week will make $7,163 a year. You should encourage them to save and teach them how to, but nothing further at first. Step back and let them make their own decisions and mistakes. If they want to spend all their money on the latest toy or video game, bite your tongue and let them. It’s better they learn now about these mistakes than later as an adult. You probably use a credit card, debit card, or checks for purchases most of the time. This is fine for you, but when your child is learning the value of a dollar, it can be misleading. Start using cash and show them how far your paycheck goes. Teach them that the little plastic card or paper check isn’t “free” money and you can’t just go to the ATM and pull money out that you don’t have. Young children don’t understand that there are people that are less fortunate out there. It’s not something on their radar or something that they think about unless they are confronted with it. By donating to charity, you can teach them that not everyone has the money and things that you have. A big part of the value of a dollar lesson is teaching your children that you must make choices when it comes to spending and it’s important to be responsible. Teach them that bills and other needs are taken care of first before you even think about a want. If they are younger, this means showing them that the new toy they want isn’t in the budget this week. If they are older, give them a set amount of money for the month and tell them to budget it, but make them responsible for a bill, such as their school lunch. They need to budget a small bill with their wants so they learn that you have to make decisions and sacrifices with money sometimes. It’s okay to use credit cards and teach your children about them, but make sure your message is clear. The money that you charge on the credit card could cost you more in the long run if you aren’t careful. Teach them that they shouldn’t consider a credit card until they are older and responsible with their spending and have a full-time job that will pay the bill. This is so important because young adults will get bombarded with credit card offers the minute they go off to college and could ruin their credit for many years.